It was recently my husbands birthday and we decided to have a few friends over for dinner to celebrate. I asked my husband what he wanted for this dinner and he said he'd like dairy. Breakfast foods for dinner - excellent! It made a nice change from the usual chicken or beef. Great company, good food - we had a really enjoyable evening. Pictured are some of the dishes, snapped with my iPhone and Instagram. Top & bottom image: Half of dessert. Strawberry, grape and basil salad with a dressing of lime juice, a little sugar, balsamic vinegar and olive oil. Refreshing! The other half of dessert? One of our guests brought a homemade key lime pie, delicious! 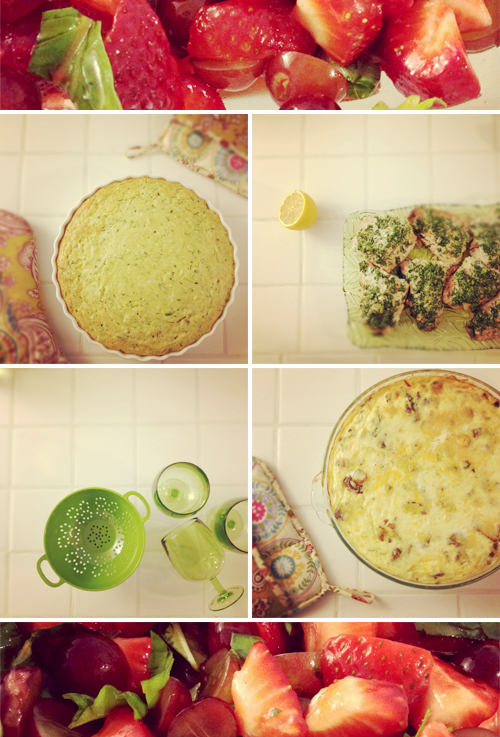 Top left: Cheese & zucchini slice - a family recipe! You'll have to ask really nicely if you want it. Bottom left: New fun wine cups (stackable) and colander from Crate & Barrel. The table looked great with white tablecloth, our white and green dishes and green drink ware. Bottom right: Crustless quiche - mushroom, spinach & tomato. We also had onion tart made by another guest and a spinach, blood orange & feta salad plus dips and homemade challah!